Posted December 24th, 2016 by Mike Boyes & filed under Child Development, Consciousness, Health Psychology, Human Development, Intergroup Relations, Personality Disorders, Social Psychology, Stress Coping - Health, Stress: Coping Reducing, The Self. Description: So are you (were you) looking forward to spending time with your family over the holiday break? If not or if you were reminded about the things you find difficult about being back together with your family what did you do? Sometimes being taken back to your childhood or adolescence by the social context of your family can be positive and sometimes negative. 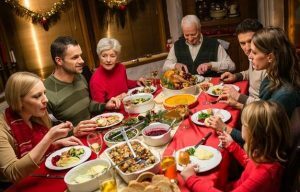 Before you read through the article linked below think a bit about your own family gatherings experiences. Are they positive or negative? What sorts of things contribute to one or the other of these outcomes? What do you do to prepare for (or to avoid) such encounters? Why do you think things go the way they do? Source: Need to rewrite your family script this Christmas? Here’s how to do it. Annie Hickox, The Guardian, Christmas Opinion. So, why do our families take us back to our younger selves? Why do the same issues (positive and negative) come up over and over again? Well, from a developmental perspective you need to remember that your family, for years, was your primary developmental context. Your parents’ parenting styles, your sibling’s personalities and the sorts of interactions you typically had (positive or negative coercive cycles) together created a space within which you grew and developed. Your reactions to those developmental contexts became part of who you are. Essentially, they became your developmental or life baggage that you carried with you when you moved out on your own. The extent to which you are aware of this baggage and of the family forces and situations that shaped it will have implications for the extent to which you have begun to make, or successfully made, changes in yourself, in your interpersonal style and in your life goals and planning. From adolescence onward we typically begin to develop the reflective skill necessary to take stock of who we are, how we behave and where and how we want to go forward. This is the core of personal identity development. Sometimes our families have provided us with baggage that are actually tools for ongoing positive development but sometimes they have provided us with the equivalent of psychological rocks that make it harder for us to move positively through the world. Visits with family provide us with opportunities to reflect on the nature of the baggage we received as parting gifts when we left home. Rather than returning to your childhood (especially if it was not positive), use such gatherings as opportunities for reflection and self-planning, and good luck! What sorts of early family experiences have impacts on who we become? Think about whether there are a few parts of who you are with family origins you can see. Do you see bits of them when you go back home for family gatherings? Are there parts of who you are that you have decided you have to change to move forward the way you want to? Can you point to typical or usual family interaction patterns that contributed to them? What have you had to do to shift what are rather deeply ingrained action patterns? Brodoff, A. S. (1988). First person account: schizophrenia through a sister’s eyes–the burden of invisible baggage. Schizophrenia bulletin, 14(1), 113. Mahoney, V. L. (1991). Adverse baggage in the learning environment. New Directions for Adult and Continuing Education, 1991(50), 51-60. Green, W., Gannaway, D., Sheppard, K., & Jamarani, M. (2015). What’s in their baggage? The cultural and social capital of Australian students preparing to study abroad. Higher Education Research & Development, 34(3), 513-526.